2018 was the first year of Melvin Fund grant and fellowship awards! Read below about the research projects that were funded, and please consider making a donation to fund even more great work in 2019. 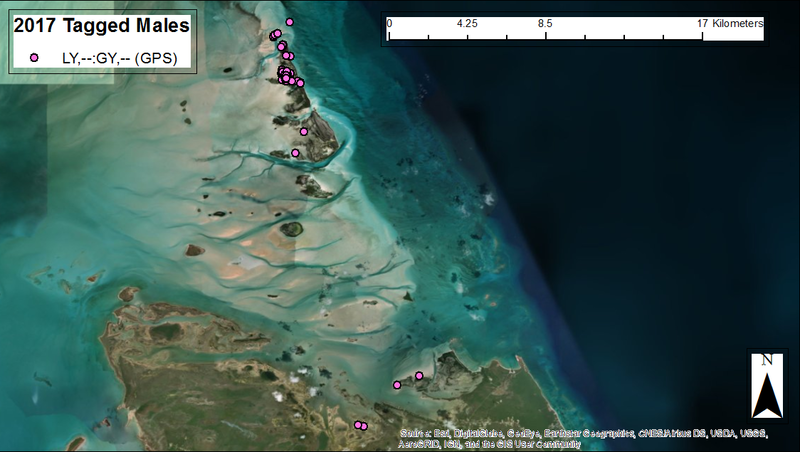 Recorded locations throughout the wintering period at Joulter Cays, North Andros, Bahamas of a Piping Plover male GPS tagged in 2017 and recaptured in 2018 at Barnegat Lighthouse in southern New Jersey. Miniature GPS tags can contribute to the conservation of federally-threatened Piping Plovers (Charadrius melodus) by identifying areas that are highly used within breeding territories, during migration, and on the wintering grounds to inform habitat management across the annual cycle. We studied the movements of Piping Plovers in New Jersey during the 2018 breeding season and the effects of the transmitters on health and fitness. We used elastic leg-loop harnesses to attach miniaturized archival GPS units (PinPoint-10, 1.1 g, Lotek Wireless) to a sample of 5 females to examine breeding season movements and habitat use, as well as to determine the safety of the tags for the birds, before deploying the units for long-term (non-breeding season) tracking on 13 females and 2 males. For short-term tracking, GPS units were set to collect spatial data four times per day at 6-hr intervals and were retrieved after approximately two weeks. Tags deployed for the non-breeding season were programmed to collect spatial data once every two days. Tags will be retrieved when adults return during the 2019 breeding season. Individuals tagged for long-term tracking during 2017 that returned to nest in 2018 were captured and their GPS units were removed. To assess the potential effects of tags, we monitored nest success and chick survival rates of plover pairs where one member had a GPS unit (tagged pairs) and control pairs (non-tagged). Based on the raw data, 95% of 20 nest attempts were successful for pairs with one member having a GPS unit compared to 53.5% of 56 nest attempts by control pairs. Nest abandonment rates were similar for pairs with a tagged adult (0%) and control pairs (3.5%). Unfortunately, of the 5 short-term units that were deployed, 4 of the units failed to record any location data. We were able to map habitat use for only a single female, which appeared to use an area that was larger than those used by males marked in 2017. We were able to recover 3 GPS tags from units deployed in 2017 and map habitat use during migration and on the wintering grounds for 2 individuals. We found that a single individual used Cape Lookout National Seashore for 1 month during migration before the GPS battery died, while the second individual traveled directly from New Jersey to the wintering grounds in the Bahamas. Placing a nanotag on a piping plover chick days before fledging. Photo by Christina Howell. Recovery efforts of imperiled populations often focus on breeding season success, yet other life cycle stages also may be limiting recovery, especially for juveniles whose fitness and survival can translate to population growth. Many aspects of Piping Plover (Charadrius melodus) ecology are well understood, but little is known about migration, habitat use, and survival of fledglings. We augmented an ongoing study, to assess the impacts of Hurricane Sandy on Piping Plover habitat use and demography on Fire Island, NY, to study survival of juveniles from fledging to migration and migration habitat use. ​We glued 31 nanotag transmitters directly to the skin and feather bases of the interscapular regions of 20 – 25 day-old Piping Plover chicks. We manually-tracked nanotagged individuals every 1 – 2 days. Contrary to 2017, when we had 25% mortality (n=3) of nanotagged fledglings, no fledgling mortality occurred in 2018. Nanotag retention was low, however, likely due to nanotags being attached with glue. Due to the uncertainties associated with Piping Plover growth between fledging and migration, we did not attach nanotags with harnesses, which likely would have increased the rate of retention. Twenty-three fledglings dropped their nanotags before migration. On average, fledglings that lost their nanotags retained them for 12 days (range, 3 – 28 days), compared to an average of 17 days (range, 1 – 31 days) in 2017 (n = 7 birds). Eight fledglings retained their nanotags through the end of our survey season (late August) or still held a nanotag the last time they were resighted within our study area. We were able to recover and redeploy 7 nanotags, thus increasing our sample size. ​We are in the preliminary stages of analyzing these data, but initial assessment indicates that post-fledging mortality rates vary by year within our study area. We will further investigate the effects of covariates such as hatch date, mass at recapture, and habitat type on survival and nanotag retention. We are currently awaiting Motus tower data from this season’s migration. Until we receive these data, we will not know whether the eight birds that retained their nanotags through our study period retained them through migration. If any birds retained their nanotags through migration this past season, we expect to receive data that will help us to identify post-fledging stopover and wintering regions. We thank the Natural Heritage & Endangered Species Program at Mass Wildlife and the Massachusetts Outdoor Heritage Foundation for granting us funding that contributed to investigating an important part of the Piping Plover annual cycle. We anticipate our results will aid manager decisions regarding fledgling Piping Plovers on Fire Island and along the Atlantic migratory route. 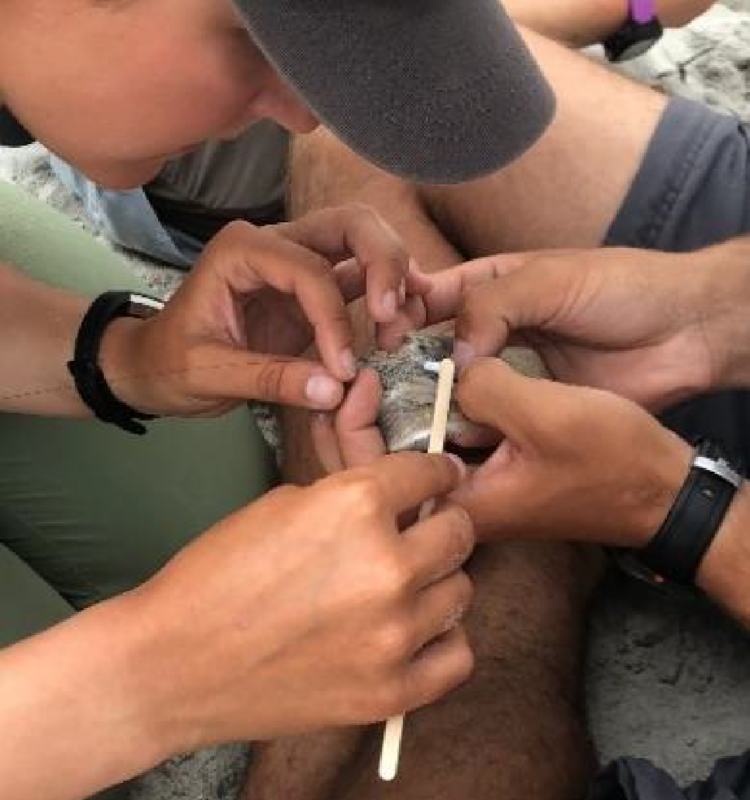 Further, we believe our nanotag retention data will be useful to inform future studies that may be implementing transmitters to monitor survival or track Piping Plover fledglings. Brynna McGlathery, Duxbury Beach Reservation, Inc. 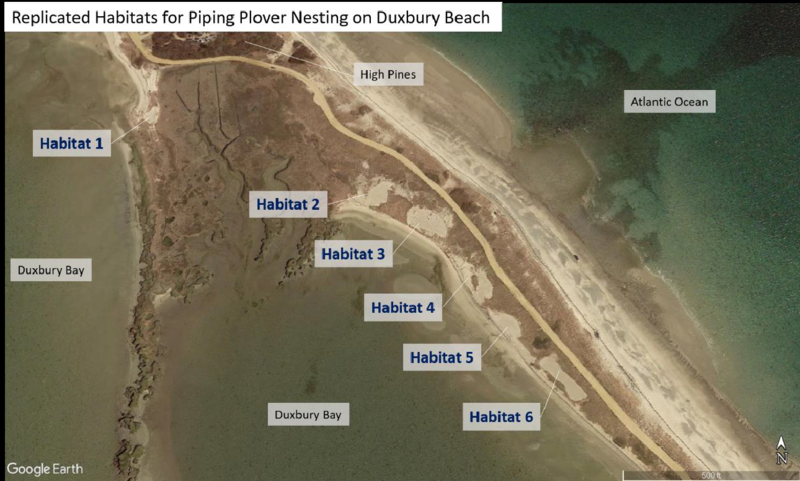 Replicated habitats on Duxbury Beach created by Duxbury Beach Reservation as artificial nesting habitat for Piping Plovers. Duxbury Beach Reservation (DBR) evaluated habitat enhancement on Duxbury Beach for nesting Piping Plover (Charadrius melodus) during the 2018 shorebird nesting season through the Scott Melvin Memorial Grant provided by the Massachusetts Outdoor Heritage Foundation. Habitat enhancement at Duxbury Beach began in 1999 and has occurred using a variety of methods from 1999-2017. ​Currently, there are six “replicated habitats” (habitat enhancement areas) on the bayside of Duxbury Beach: three were created in 2016 and three in 2017. Five of the six are clustered in close proximity to one another. Due to storm alterations at the site and difficulty of access, no maintenance was performed on the replicated habitats in 2018. In 2018, we evaluated the life span of the habitats, the characteristics that may attract plover pairs, and the feasibility of maintaining areas over time. Data collection occurred every five days, with nesting data collected during each session and vegetation data collected every other session. General nesting activity, predator activity, and human presence was recorded throughout each session. At this time, a full analysis of the 2018 season is underway. Preliminary analysis and observations suggest that pairs preferred replicated habitats that were larger and less vegetated. The two pairs that nested did so in the two largest habitats and the five habitats in which scrapes were observed were the five largest. No scrapes were observed in the smallest habitat, which is also geographically separated from the others. This pattern was also true in 2017 when nesting occurred in the three largest habitat areas. In 2018, 72% of scrapes were observed >0.5 m from any vegetation. At the scrapes where there was vegetation within the one square meter of observation, the percent cover was between one and five percent. Nest site fidelity may play significant role in nest site selection. During 2016 – 2018, the only replicated habitats in which plovers nested were those created in 2016. Pair territory size may also be important. In 2018, scrapes were observed in all five of the adjacent replicated habitats. It is unknown if all of the scrapes were produced by the two pairs that laid nests; however, following laying, no new scrapes were observed. It is possible that the territories of each of these pairs extended over multiple replicated habitats. In 2018, the Massachusetts Division of Fisheries & Wildlife (MassWildlife) selected the Massachusetts Audubon Society’s Coastal Waterbird Program (CWP) to recruit the inaugural Melvin Fellow, an early-career scientist supported by a memorial fund to honor Dr. Scott Melvin, a conservation scientist at MassWildlife who pioneered Piping Plover (Charadrius melodus) protection in the state from the early 1980s until his death in 2014. CWP developed a fellowship project and appointed Jasmine Weber-Pierson, a senior at the State University of New York at Geneseo and a 2017 Coastal Waterbird Program Trainee, to investigate possible solutions to a growing conflict in beach management in our climate-changed coastal environment. ​Sea level rise and erosion along the Massachusetts shoreline have led to extensive renourishment of beaches to retain coastal defenses for buildings and roads. Beach managers seek to plant beach grass on renourished dunes to help stabilize the dune, but this practice is regulated due to plovers’ preference for sparsely vegetated beach habitats—dense vegetation would prevent plover nesting. Beach stability and Piping Plover nesting preferences seem to be at odds, so understanding how vegetation might promote both nesting and relative stability of dunes is very important for both coastal beach management and Piping Plover conservation. Jasmine’s objectives were to: (1) identify priority Piping Plover nesting beaches with a history of many years of activity, numerous pairs nesting, and relative success; (2) assess shoreline changes at these beaches from online data to understand the risk of habitat loss; (3) evaluate the ability of beaches to retreat naturally given existing infrastructure, erosion rates, and sea level rise; and (4) identify where beach plant density may be encouraging or discouraging nesting, and locations where vegetation management projects are needed. With help from the entire CWP field staff, Jasmine collected vegetation and slope data on 21 key nesting beaches totaling 27 miles (232 transects!) and found that beaches with relatively low nesting success had greater vegetation density at the toe of the dune. Using online historical data on shoreline change, she identified nesting beaches most at risk of significant future erosion. Jasmine presented the results of her study, including management recommendations, at the statewide Coastal Waterbird Cooperators’ Meeting held at Cape Cod Community College in August 2018.